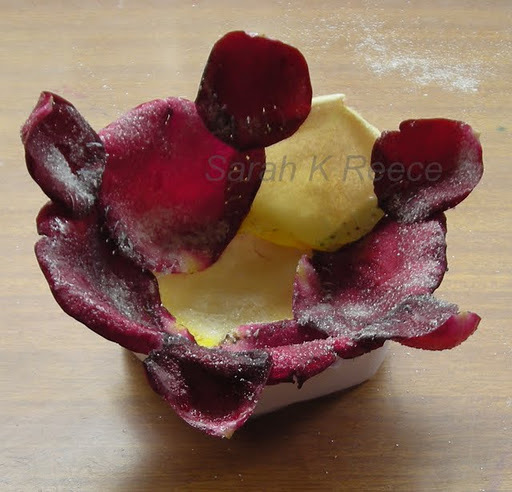 It has petals from three different roses in it, all hand sewn together with white cotton thread, then crystallised by painting with egg white and sprinkling with castor sugar. The brief was to create something like a bowl, from any material we wished. It’s lovely, rather brittle and very fragile, and smells of musk or pink turkish delight. ← Should we ‘never be a victim’? Delicate, beautiful and amazingly resonate. The frailty of Nature is combined with the inner strength of mind of the creator of the object. Well done Sarah, you are a marvellous maker of beauty!